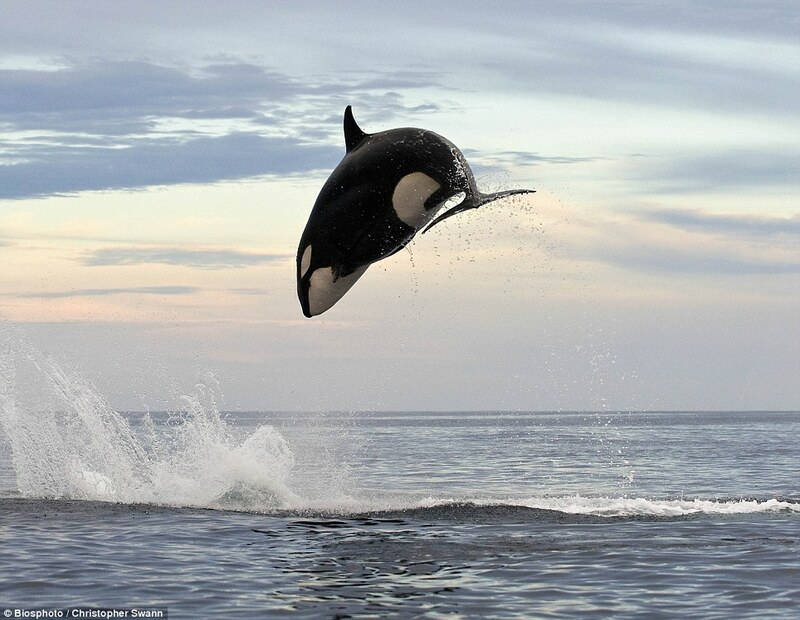 With the setting sun just beginning to turn the sky pink, a killer whale leaps out of the ocean and soars into the air, spray cascading down in its wake. It is a magnificent image. Except the whale’s dive has a purpose – the dolphin quivering 15ft below. These astonishing photographs record the final act of a chase that lasted two hours, and ended with the dolphin trapped in the jaws of the eight-ton orca. The dolphin was originally part of a small group swimming off the Mexican coast but the others managed to get away, leaving it at the mercy of a whole pod of whales. Photographer Christopher Swann, who captured the extraordinary scene, said: ‘The killer whales tore round at full speed for two hours. ‘We never knew where to look because they erupted out of the water in one place, disappeared in a thrashing of foam and reappeared in a totally new location. 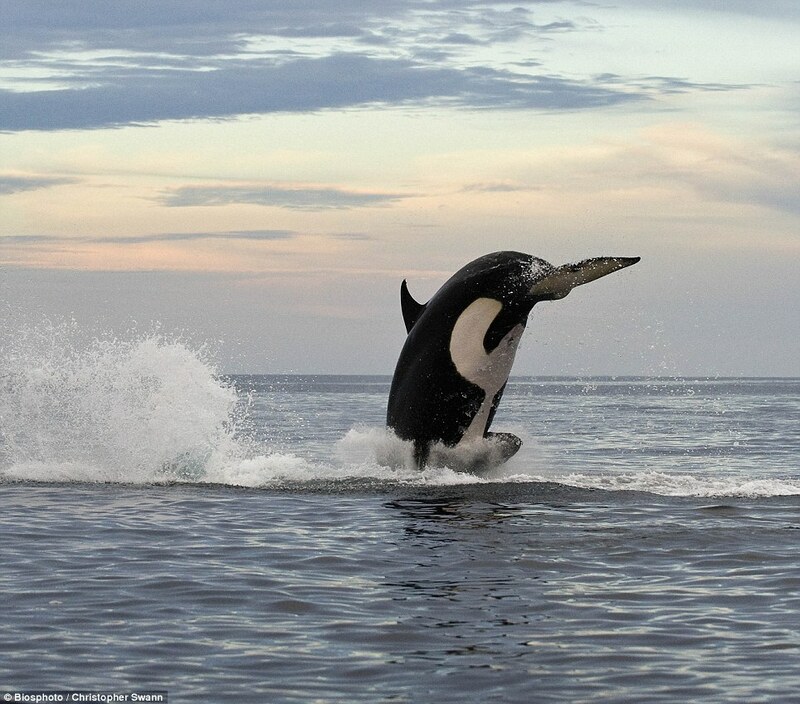 ‘On one occasion the killer whale burst out of the water directly in front of us, and about six or seven metres ahead. 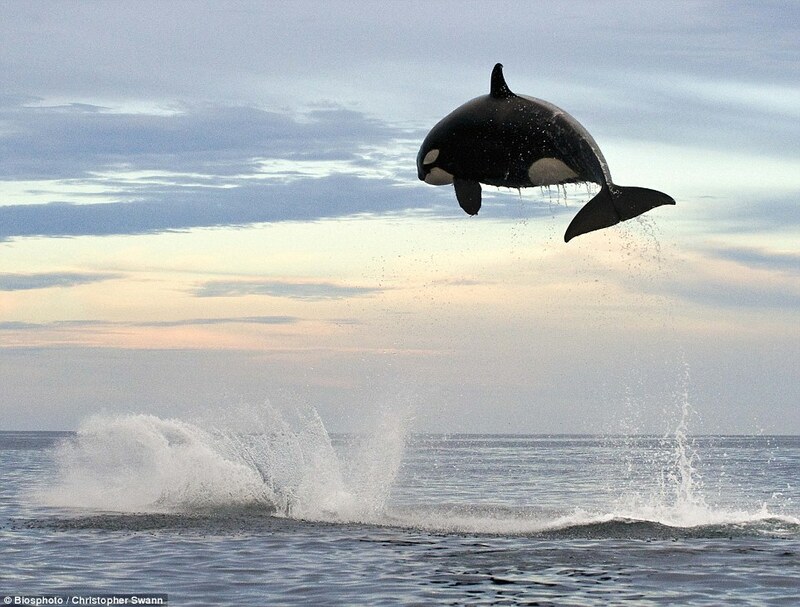 The father-of-one, who has been whale watching for more than two decades, said the killer whale in the photograph appeared to do most of the chasing. Mr Swann added: ‘The terror and fight for life of the dolphin was palpable. One felt one could feel the adrenalin in his veins and his pulsing heart as he raced for his life. ‘[He went] back and forth but [was] always met by another whale blocking the way. 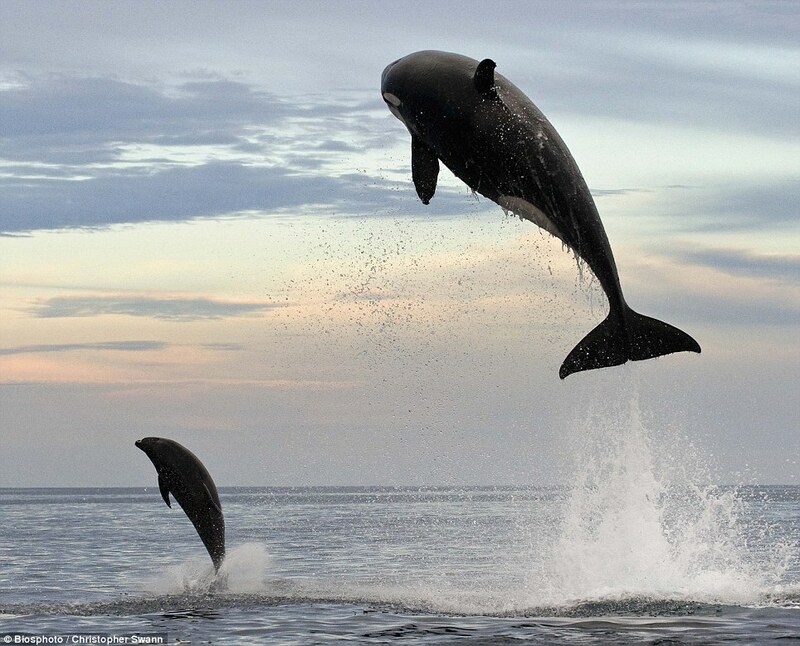 Sometimes, three or four times, the whales would knock the dolphin out of the water – once with their tail. ‘Incredible when you consider that this was a large healthy dolphin. 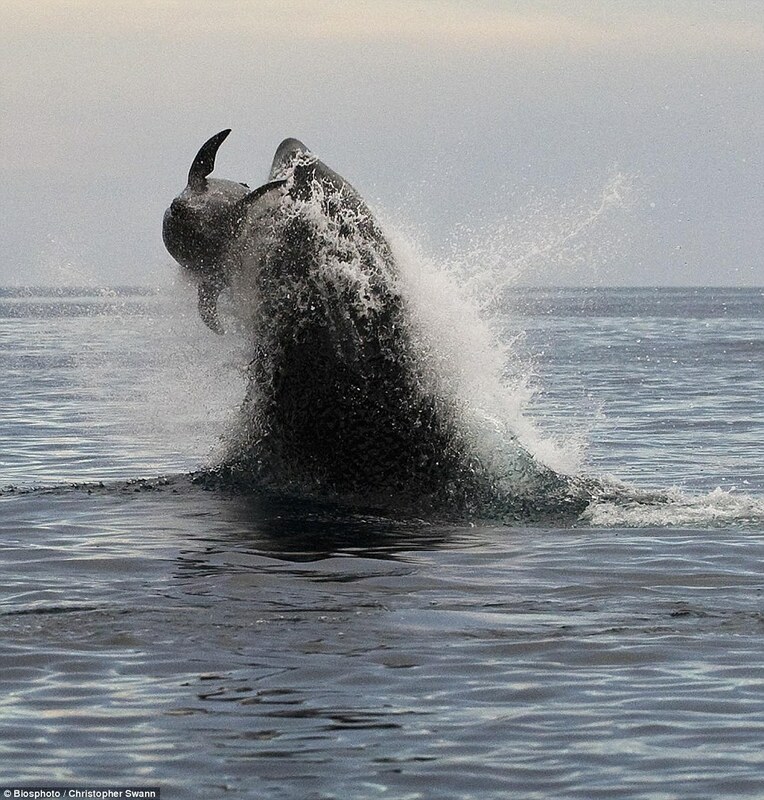 It is staggering how the whales treated it like a plaything.